American robins migrate north to breed, sometimes long distances to the far north. But climate change is unfolding faster in the arctic and boreal region than anywhere else on Earth, possibly affecting many animals and plants that live or migrate through there. Scientists are tracking some of the animals to find out what’s going on—including American robins. Ecologist Natalie Boelman from Lamont-Doherty Earth Observatory leads a group of scientists from around the country who are working on “Animals on the Move,” a multi-year field campaign that is part of a larger NASA-sponsored effort to understand the impacts of climate change in Alaska and western Canada. For “Animals on the Move,” scientists are tracking several species—including bears, caribou, moose, wolves, Dall sheep, Golden eagles and songbirds. At the same time, researchers are working in the field to understand how plant life is responding to climate, and using satellite data to monitor environmental and ecological changes. Boelman also engaged students at the Cottage Lane Elementary School in Rockland County, N.Y., who named the birds and followed their progress on an app. 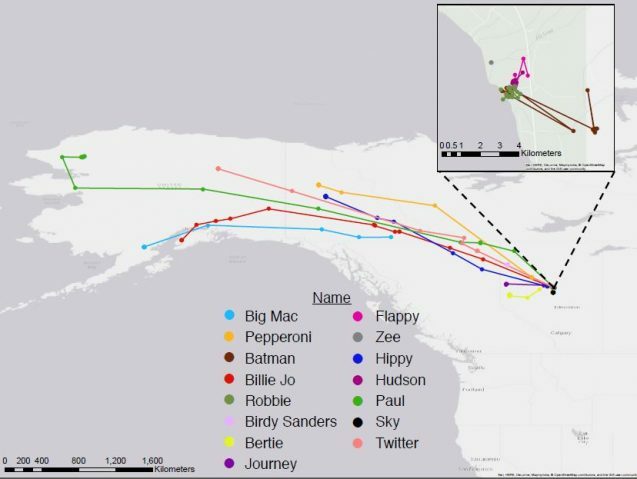 The above map shows how far some of them traveled: Some stayed close to Slave Lake, others went far afield, into the Yukon and as far as western Alaska.This year, Boelman and colleagues traveled to Slave Lake, Alberta, Canada, to tag robins migrating through the area with tiny tracking devices that send signals to satellites and allow scientists to follow the robins’ progress. The GPS trackers weigh about 4 grams and are the size of a dime. Every two days from April to June, the tags sent a signal to a satellite that transmitted the location to scientists. Researchers were able to track 15 birds of the 28 they tagged. Big Mac, Pepperoni, Billie Jo, Birdy Sanders, Bertie, Journey, Hippy and Twitter flew an average of about 1,215 kilometers (755 miles). “Paul,” named in memory of teacher Paul Doctor, traveled 3,220 kilometers (2,000 miles). Over the next two springs, Boelman and her group will tag more robins passing through Slave Lake. They’ll be linking the birds’ movements with information about the environment and ecosystems they move through to understand what may be influencing their migratory behavior. The core “Animals on the Move” team includes six scientists from five U.S. universities: Boelman at Columbia University; Gil Bohrer, Ohio State University; Jan Eitel and Lee Vierling, University of Idaho; Mark Hebblewhite, University of Montana; and Laura Prugh, University of Washington. The project is a collaboration across numerous institutions in the U.S., Canada and Germany. For more information, visit the team website at NASA.